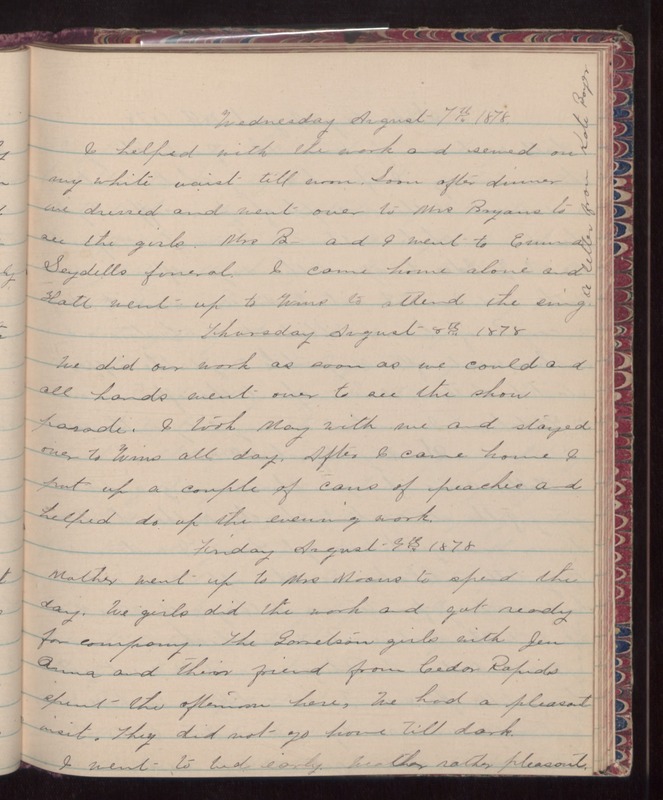 Wednesday August 7th 1878 I helped with the work and sewed on my white waist till noon. Soon after dinner we dressed and went over to Mrs Bryans to see the girls. Mr.s B- and I went to Emma Seydells funeral. I came home alone and Hatt went up to Wins to attend the sing. A letter from Kate Boyer. Thursday August 8th 1878 We did our work as soon as we could and all hands went over to see the show parade. I took May with me and stayed over to Wins all day. After I came home I put up a couple of cans of peaches and helped do up the evening work. Friday August 9th 1878 Mother went up to Mrs Moons to spend the day, We girls did the work and got ready for company. The Garretson girls with Jen Anna and their friend from Cedar Rapids spent the afternoon here. We had a pleasant visit. They did not go home till dark. I went to bed early. Weather rather pleasant.